Every year at midwinter we eagerly awaited Jan Frentrop's greetings of the season. Since 1988 they were accompanied by a self-made picture of a curious ice formation, and a few lines trying to explain its origin. With the help of my dad I have traced most of these cards, if not all. Jan Frentrop died in 2000. I have decided to retain his "icy observations" on this site, in that way helping to keep alive the memory of a very special friend. The first one does not show a very peculiar ice formation. Yet you will rarely see the water-meadows flooded with their surface frozen. 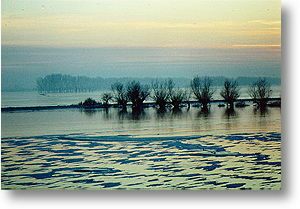 It's because you first need lots of rain or melting snow in Central Europe to cause a high water-level of the Rhine. So a period of serious thaw must be followed by very hard frost to create this immense icy spectacle.